Are you looking for a Catholic Bible? Then we have good news for you: Welcome to the Catholic Public Domain Bible (CPDV), a modern Bible for Catholics completed in 2009. 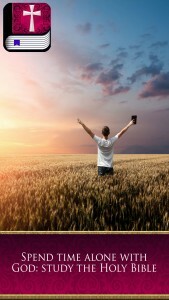 It’s a beautiful new Bible app that you can download for free and read it whenever you want, at home, at work, on the bus. After downloading, you can also use it without Internet connection. A Bible accepted by the Catholic Church must have the 73 books included in the Catholic canon of Scriptures and an imprimatur sign from a competent authority (usually a bishop). The Catholic Public Domain Bible include the Catholic biblical canon of 73 books: Genesis, Exodus, Leviticus, Numbers, Deuteronomy, Joshua, Judges, Ruth, 1 Samuel, 2 Samuel, 1 Kings, 2 Kings, 1 Chronicles, 2 Chronicles, Ezra, Nehemiah, Tobit, Judith, Esther, Job, Psalms, Proverbs, Ecclesiastes, Canticles, Wisdom, Ecclesiasticus, Isaiah, Jeremiah, Lamentations, Baruch, Ezekiel, Daniel, Hosea, Joel, Amos, Obadiah, Jonah, Micah, Nahum, Habakkuk, Zephaniah, Haggai, Zechariah, Malachi, 1 Maccabees, 2 Maccabees, Matthew, Mark, Luke, John, Acts, Romans, 1 Corinthians, 2 Corinthians, Galatians, Ephesians, Philippians, Colossians, 1 Thessalonians, 2 Thessalonians, 1 Timothy, 2 Timothy, Titus, Philemon, Hebrews, James, 1 Peter, 2 Peter, 1 John, 2 John, 3 John, Jude, Revelation. What a tremendous blessing to have the Bible with you every day! Download Catholic Bible Verses free and easily on your phone.